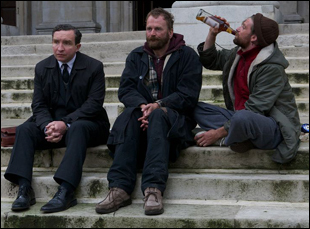 In preparation for his role in the new film “Still Life,” Eddie Marsan went on four visits with British council workers who are tasked with a most unusual assignment – to find any known relatives of those who pass away alone with no obvious next of kin. “It showed me the respect they had for the people who died and how many people in big cities die completely alone with nobody to bury them and mourn them,” said Marsan, who was quite moved by the “very sad and very poignant” trips. Such versatility has made Marsan a favorite of Mike Leigh and obviously, “Still Life” director Uberto Pasolini, who didn’t hesitate to place his feature helming debut on Marsan’s broad shoulders after the two worked together a decade earlier when Pasolini was a producer on “The Emperor’s New Clothes.” The rare leading turn for the busy character actor is reason enough to see “Still Life,” which is anything but due to Marsan’s controlled yet illuminating performance, but as the actor told us shortly before the film is released stateside, it isn’t just a look into the life of someone who typically eludes the spotlight that was compelling to him, but a view at his hometown that he rarely sees onscreen. This film spoke to me because it’s such an honest, beautiful film and it was a very personal film for Uberto to make. He had just gone through a divorce and a period of loneliness, so being directed by him was great because he written the script and he knew exactly what he wanted. I also come from London, so I get sent lots of scripts about London and most of them are cliches. They’re always about gangsters with double-barreled shotguns and people with dodgy cockney accents. I don’t make films about cockneys. I want to do unique London stories, if I can and this was a unique London story, so I felt up to it. Is it more interesting to play such an internal character rather than someone who wears emotion on their sleeve? The one thing I kept in my head while playing this was that [John May] wasn’t aware of how he looks or how he comes across, so it was very enjoyable to play somebody who was completely honest, humble and simple in that sense. As an actor, I just do whatever’s necessary and appropriate, really. If a character is expressive and that’s appropriate, then I do it. If it’s not appropriate, there’s no need for it. Was there a touchstone that helped you unlock the character? Uberto had written the character so well – everything you saw in the film was in the script. I kept in my mind that John May was collared up, but slightly inconspicuous – he comes and goes and no one sees him come and go. So I made anything I did with him very, very gentle and very delicate. He’s the kind of man you wouldn’t look at. If you saw him on a bus, you wouldn’t remember him. I put in my mind what makes some people unmemorable and what makes him unmemorable is he’s not trying to be somebody who [tries to impress people]. He just does what he thinks he should be doing. So that was a challenge as an actor was to not show off. Is it any different for you when you come into a film knowing you’re in every scene than when you just come into a few scenes? I’ve never really [approached] it from that way because I’ve learned from really experienced actors that there is the methodical structure and that acting is a methodical process in a sense. It’s about being judicious, it’s about not showing off. So you have to be more methodical in playing a central character, you have to make sure you’re not overacting, you’re not patronizing, you’re very gracious and I aim to do that. I’m not a really showy actor in any sense. I’m not a good enough actor to be a bad actor. I’m not a good enough actor to show off. Some people are technically [skilled] and they can show off. I don’t know how to do that because they’ll know when I’m doing it, so I never do it. With that approach, did you actually feel a kinship with John May, just going to do a job, not expecting to be rewarded? Uberto has said that it was important for him to keep the camera still and immobile. Did that have an impact on your performance? Stylistically, I think the film is a very Italian trip and John May is [an outsider] because he doesn’t speak the language. It’s an Italian film about London — that’s the thing I thought about the film when I read it and that’s why I wanted to do it. There was an efficiency and a certain lightness of touch that was in the script. I always enjoy films that are a fresh take on London and I didn’t want to do a London film about London because quite often London films about London are cliche. And this film isn’t a cliche. Are there certain things you still want to do as an actor? You play such diverse roles year in and year out. I had just shot the pilot for “Ray Donovan,” then I went into “Still Life” and when I finished “Still Life,” then I was going to shoot “The World’s End” with Edgar Wright and “Ray Donovan” was picked up [to series], so to go from Terry Donovan, John May, “The World’s End” with Simon [Pegg] and Nick [Frost] and then go back to “Ray Donovan,” that’s what I enjoy. In order to be employed — because I’m a character actor — there have to be lots of different people you can play. I’ll never be two things the same consecutively. Some actors try to be completely different and I’m still trying to do it now. It’s both a challenge and an enjoyment of the craft and a way of maintaining employment and keeping people interested. “Still Life” opens on January 16th in New York at the Quad Cinema and the Smith Center for the Arts before expanding across the country in the following weeks. It is also available on iTunes and on demand. Review: Desiree Akhavan Finds Her Way With "Appropriate Behavior"
Interview: Stephen Belber on Striking Up "Match"